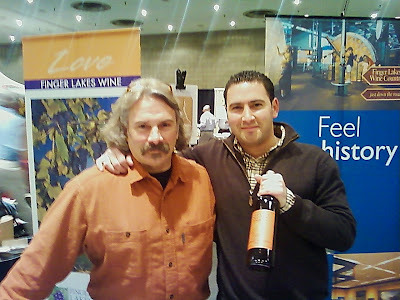 Steve Shaw and Steve Shaw Jr. are a ubiquitous presence in the New York wine world. At least one of them seems to be at every event. And that's a good thing for us. Because their wines improve each year, and they are striving for excellence. They are striving for quality. And they are succeeding. And that's good for all of us! 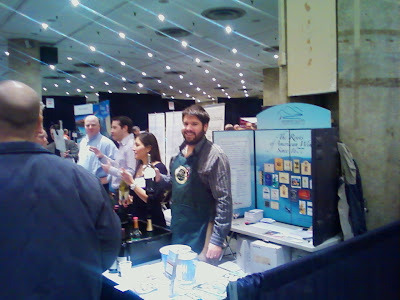 At the New York Wine Experience I had the pleasure to taste several of their offerings, with great pleasure. Steve Sr. has been working vines for more than 25 years (I think it's longer, but I'm trying to be nice, and not make him sound like Methuselah). He's very serious about growing quality grapes. 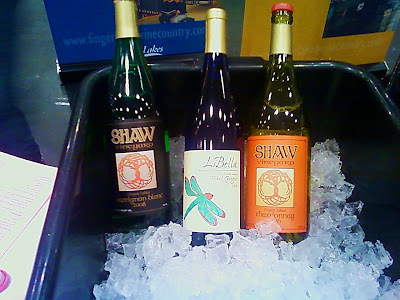 Shaw continues to truly put distance between itself and many other wineries with their tremendous array of brilliant white wines. The Shaw Chardonnay 2006 was incredible. Light, fruity, tremendous nose (tropical fruits, slightly floral), but with a nice, dry, smooth finish. It was a dazzling light bright white wine. The Sauvignon Blanc was also brilliant. Lots of beautiful flavors on the nose. On the palate, it danced. A light white with incredible staying pour, with just the right amount of pucker, but not too much. Fabulous! And the LiBella Pinot Gris 2008 was excellent. A beautifully overwhelming nose. Fantastic. Tropical fruits. Floral. A touch of pucker, but a lovely, lovely light white. At around $10 or slightly more, one of the best white wine values in all of New York state. An elegant, elegant, brilliant table white. The 2005 Cabernet Sauvingon was a big, luscious wine, with lots of incredible fruit up front. Raspberries. Dark cherries. A touch of vanilla. Nice tannins. This is wine you can drink now, or put in your cellar for ten years. This is an incredible wine. And it's from relatively young vines for a Cab Sav, so you know the quality is only going to improve, especially in the Shaw family's hands. 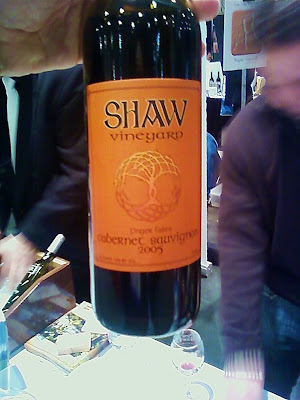 Run, don't walk, to your store, and demand Shaw Vineyard! 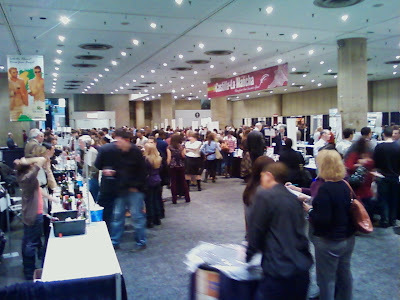 The New York Wine Expo kicked off tonight, Friday, at the Jacob Javitz Center. And many east coast winery personalities and winemakers were on hand. 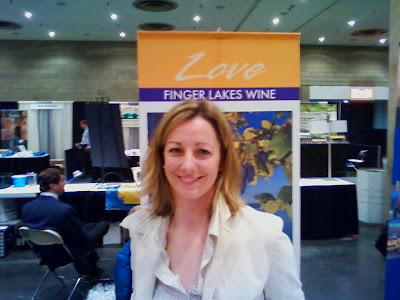 Above is Morgen McLaughlin of Finger Lakes Wine Country. 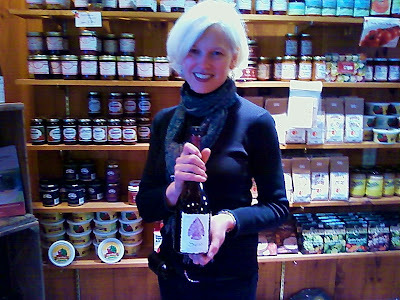 She's done an incredible job promoting Finger Lakes wineries. The folks from Sharpe Hill Vineyard, Pomfret, CT. 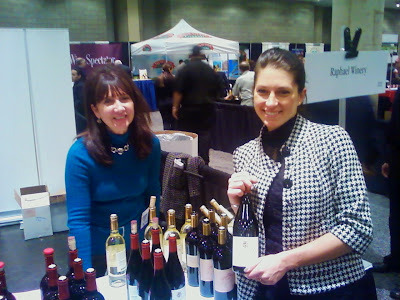 The Hudson Valley Wine Country booth was pouring Brotherhood, Millbrook, and Hudson-Chatham. 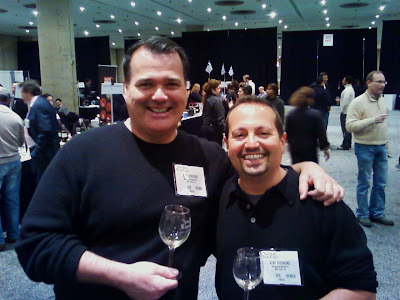 Jeff Jenssen & Mike DeSimone, the World Wine Guys, were prowling the aisles, laughing, tasting, and having fun. These guys know a lot about wine. Despite the brutal snowy day, the hall was full and hopping. 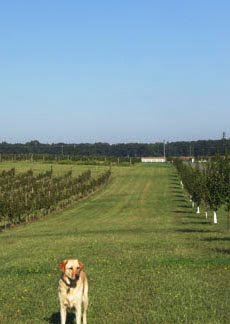 Duncan and Robin Ross planted their vineyard on a cool day in May of 2006. Their vineyard is located in the Niagara Escarpment American Viticultural Area wine-growing region. The hills that support their vines slope from South-East to North-West. They have 65 rows of grapes planted, divided amongst the varietals of Merlot, Syrah, Cabernet Sauvignon, Chardonnay and Cabernet Franc. They adherence to low yield practices to increase the fruit intensity. 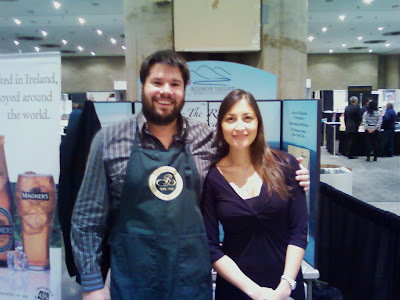 I recently caught up with Robin while she was in town to do a tasting. She had slogged five-and-a-half hours in the snow and rain. I felt so bad for her. But for me, it was an opportunity to sample some of their wonderful wines. The estate grown Reserve Chardonnay was fermented in French and Eastern European oak barrels, then aged for 13 months. Not usually my cup of tea. I like more minerally stuff. But this was only slightly buttery, showing only a hint of oak. Rich, complexly. Really sophisticated. Excellent! 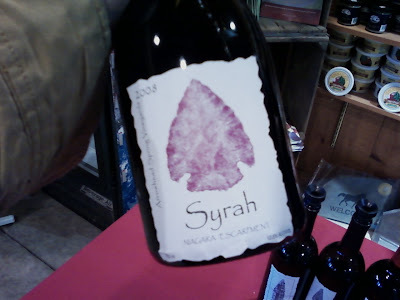 Their estate Syrah is made in a French style, aged one year in American Puncheons (large barrels) and smaller French oak barrels. This dry red is lighter than you might expect if you're used to more plum and prune from California Syrahs. But as an easterner you shouldn't expect that. This wine has plum, a hint of Cassis, and pepper. It's almost like a Pinot. It's very lovely, with an excellent, peppery finish. According to them: A composition 40% Cabernet Sauvignon, 40% Sangiovese and 20% Cabernet Franc, this wine is hand crafted from the best fruit chosen through a meticulous sorting process. It is aged for 22 months in French oak barrels; the best of these lots are then selected for use in Apogee. The goal is making the best possible wine, rather than emphasizing individual varietal character. 86 points, Wine Enthusiast. This was my favorite. A great combination of bright and dark fruits. Cherry. Plum. Raspberry. A touch of vanilla. A big, dry finish, with nice acidity and nice tannins. Really fabulous! This is their "Port Style" meritage wine made from 29% Merlot and 71% Cabernet Franc. The wine is aged in new American oak barrels for 10 months and has 18% alcohol and 5% residual sugar. A very nice port! Layers of honey and peach make for a wonderful golden dessert wine with just thr right amount of sweetness and acidity. Very nice! Go to Arrowhead Spring Vineyards....instantly one of the best wineries in the Niagara region. We had company the other day, and we were serving cheese to go along wit some wine. One person wanted white, the other four (including myself) wanted red. They were New York state wine drinkers. I wanted to impress. So I went down to the cellar, and pulled out another old dusty one. 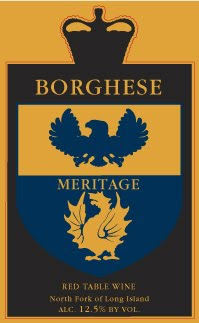 This time it was a 2002 Castello di Borghese. This is the second Borghese I've pulled out in the last two weeks. 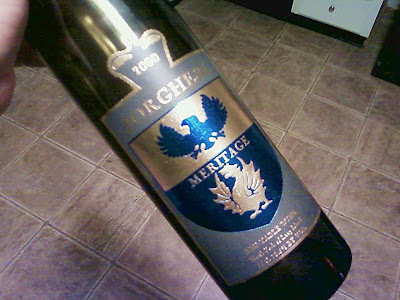 The Meritage is a Bordeaux blend of 40% Cabernet Sauvignon, 20 % Merlot, and 20% Cabernet Franc. 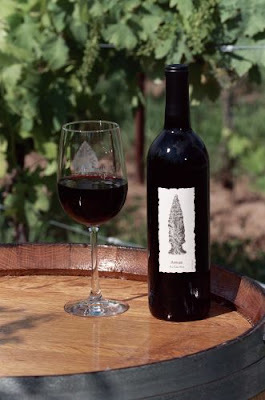 They use their highest quality, estate grown reserve grapes to make this Meritage. Smoky cedar and dense plum scents. It was a big, fruity red. Lot's of raspberry and plum on the nose and lots of dark cherry, plum, and raspberry on the tongue. Big and soft. Delicious. Wonderful, dry finish. We absolutely enjoyed it at the right time! And my friends (and I) were very, very impressed. OK, so everyone knows that I think Bob Bartlett is one of the most talented fruit winemakers in the world. As I have said before, if he were in France or Belgium, there be a stature of this guy somehwere in a town square. He's that good. And to prove it, you shouldtry his Blackberry Wine (sweet). I usually hate blackberry wines. I can only think of two or three that didn't make me absolutely blanche. Usually, they taste like lollipops flavored with booze. No so, here. 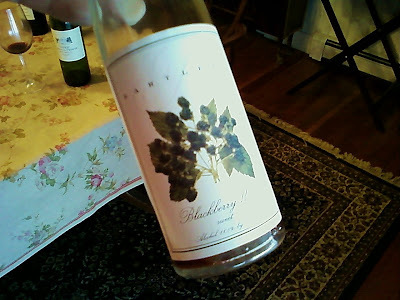 This was a big, deep, almost cassi-like dark red dessert wine, with lots of flavor, lots of acid, and a great finnish. Ended with a touch of pucker, which makes it sing! A wonderful, wonderful wine! Bob does it again! I first met David Whiting in the summer of 2000. The winery wasn't two year old. 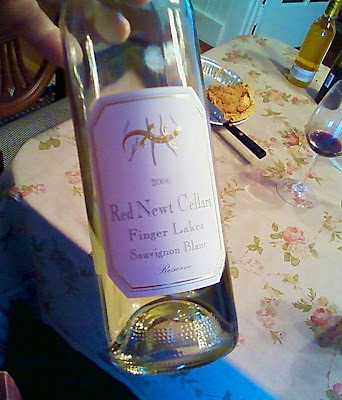 Red Newt Cellars was founded in 1998 by David and Debra Whiting. Wine production was started with the 1998 vintage with a mere 1,200 cases of Chardonnay, Riesling, Vidal, Cayuga, Cabernet Franc, Cabernet Sauvignon and Merlot. The first white wines were released at the grand opening of the winery and restaurant in July of 1999. Now, this is not to say that David Whiting and I know each other. I have met him several times, but always as a consumer. He would never remember me. But I remember him...well, maybe more accurately, his wine. 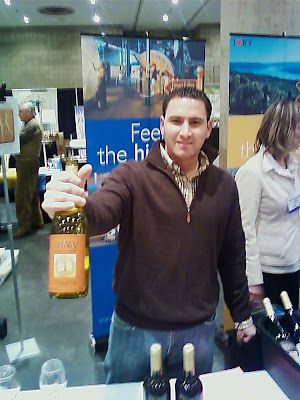 I am a big fan's of David's wines and the 2006 Finger Lakes Sauvignon Blanc is incredible. Dominique made a salad of fresh romaine lettuce, diced apples and pears, a little blue cheese, and some other shredded veggies, which she doused carefully with olive oil and lemon juice. It was a phenomenal salad, which she paired with a whole wheat baguette. David's Sauvignon Blanc stood right up to the salad. It was fresh, crisp, clean, bright. Nice fruity flavors up front (so many bad Sauvignon Blancs are a bland white wash) and good acidity. Refreshing. A nice grapefruity ending. A marvelous wine! 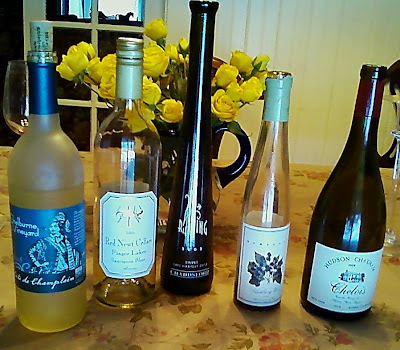 Last night we were tasting numerous dessert wines, and one of them was a Chaddsford Riesling 2002 Sweet Late Harvest Style from Chaddsord Winery in the Brandywine Valley in Pennsylvania. The winery was founded by Eric and Lee Miller. Eric is the son of Benmarl founder Ben Miller. Eric is one of the most talented winemakers on the eastcoast. Chaddsford Winery, located in the Atlantic Uplands district, is among a handful of wineries in the eastern United States who have achieved a national reputation for producing premium wines of world-class stature. Since the winery's first release in 1983, each successive vintage has received critical acclaim from wine writers and critics across the country. Among those who have given top marks to Chaddsford wines are Robert Parker, The Wine Spectator, Bon Appétit, Gourmet, Food & Wine, Decanter, Wine Enthusiast and the New York Times. We tried the wine while were were eating an apple pie from Gigi Market at Greig Farm. The pie was fabulous! The wine was great, but it didn't do well with the pie. And we set it aside for a different wine. But after the pie was finished, we came back to it, and when I came down this morning, thinking I'd have a glass again tonight after dinner, I was extremely disappointed. It was finished. Eric's wine is not an overly sweet, ice wine. Instead it is an elegant, semi-sweet wine, with lots of flavor and nice acidity, which keeps it from being a gross sticky confection. Instead, there's melon and honeydew, and a touch of... mango? Maybe some sour apple? It would have been better if we had served it with the cheese and raisin-nut-bread we had enjoyed earlier. But there was no denying, at the end of the night, it was the wine everyone was savoring. An Evening's With Linda and Bob! Had a great dinner last night with Bob and Linda of Hudson Valley Wine magazine. These two folks have really done a lot for Hudson Valley Wine. We had a great time with them. The new issue will be out in April, and of course, they are also sponsoring a Hudson Valley Label Contest. Very exciting! We started off with a Spanish cava, and then moved to white wine with salad, red wines with Dominique's famous pumpkin pasta, and then dessert wines with a fabulous apple pie. We had a fabulous Stag's Leap 1999 Cabernet Sauvignon and a tremendous Chateau Cambon La Pelouse 2000. Both were incredible!!!! Of course, we drank some east coast wines as well. Some of those reviews will follow. But be on the look out for the next issue of Hudson Valley Magazine and the label contest! OK, so I am a sucker. A true American consumer. I'm not so much into t-shirts....but I am a sucker for a winery baseball hat. I probably have at least twenty. What can I say? I have them from all over the world. I'm nuts. I love 'em. My wife is horrified. "Just what you need, another hat!" she'll say in a huff when I show off my newest trophy. And then there's the problem of where do they go? She finds them all over the house (because I wear them of course). Of course, I am chided like a little baby - "Please pick up your hat!" or "Please put your hat away!" Some times she uses more colorful language to describe the hats - depending on what kind of mood she's in. And now my sons are growing up, and they think it's cool to wear one of dad's hats. So when I'm not looking or not around, they'll wear one of my winery hats. And then inevitably, they leave them somewhere...anywhere. And then I hear my wife calling my name in a huff! There's no winning. Be that as it may, I continue to jones for winery hats. 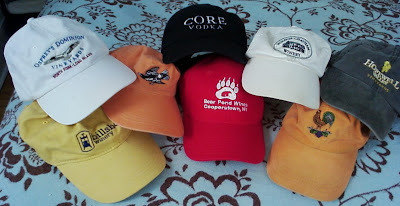 Above are my east coast winery hats. Many are missing. Especially one of my favorite - Red Tail Ridge. Anyway, these are some east coast winery hats. Last night, we met with a few old friends. And for the occasion, we opened at their house, another dust covered bottle - this time a Castello di Borghese 2002 Pinot Noir. As many of you already know, this was the old Hargrave winery, founded by Louisa and Alex Hargrave, the oldest vineyard in Long Island. 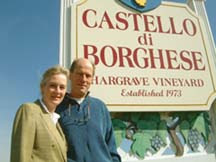 Since 1999, the first vineyard on the North Fork has been in the creative hands of Prince Marco and Princess Ann Marie Borghese, who promptly renamed it Castello di Borghese -- Castle of the Borgheses. 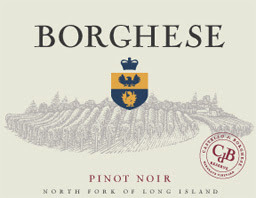 The 2003 season marked the 30th anniversary of this founding vineyard of the Long Island wine industry. Ann Marie and Marco continue to apply new levels of energy, watching the vineyard evolve graciously under their stewardship. Dominique and I went there during our tenth wedding anniversary, and I bought, what Dominique then said was "too much wine." That is a constant refrain given my spendthrift ways when it comes to wine purchases. Dominique had bought a new cheese which she was dying to try. And so she opened it up, and laced it on the table. It was excellent. A hard, cheddar/Parmesan style cheese. Nice nuttiness. A little sugary crunch to it. Excellent! "John Lee Roth's Private Reserve, a new cheese from Wisconsin's 17-year-old Roth Käse dairy, had an auspicious debut at this year's American Cheese Society competition," wrote Janet Fletcher in the September 7, 2007 article Roth's cheese stands alone on SFGate.com. "The cheese placed first in the American Original category for cow's milk, a prestigious award created for cheeses that are uniquely American in inspiration and not modeled after an existing cheese from elsewhere. It also placed third overall, out of more than 1,200 entries, an impressive feat for a newbie," wrote Fletcher. "Roth Käse specializes in alpine-style cheeses, such as Gruyere. 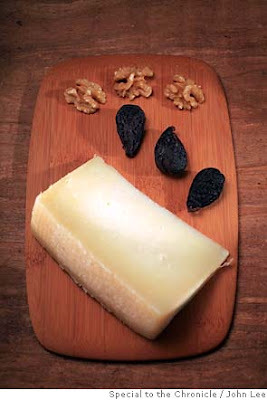 In fact, its Surchoix Gruyere took Best of Show at the ACS competition a few years ago. But for its Private Reserve, the company was aiming for a style "other than Gruyere," says Fermo Jaeckle, the company's chief executive." Back to our wine. So we opened the bottle of Pinot Noir. It has a beautiful, translucent light-ruby red. A nice nose of dried cherries and a slight touch of vanilla. The wine filled your mouth with fresh cherries, and finished dry, with a dash of black pepper at the end. It was wonderful. And a great accompaniment to the cheese. This wine cellared well, and was smoother and more elegant than when I had first tasted it back in 2005 - a testament to good wine making. Wonderful! Everything you hope for. The kids played, the adults chatted, and sipped wine and ate cheese. A great night, and a great time with old friends. We have about three feet of the fluffy white stuff surrounding the house here in New Jersey. It's that time of year. But three feet is a lot for this region. And I'm sick of it all already. Now, tonight, I came home early form the city, because my wife was in town with the boys. They came in around lunch time. We all went out for lunch. They went to the Metropolitan Museum of Art, and then we met at the parking garage late in the day and were in the Lincoln Tunnel by 5pm. We went home, and were joined by my father in law, Bob Hoover and his dog Lulu, and we ate spicy Chinese food. 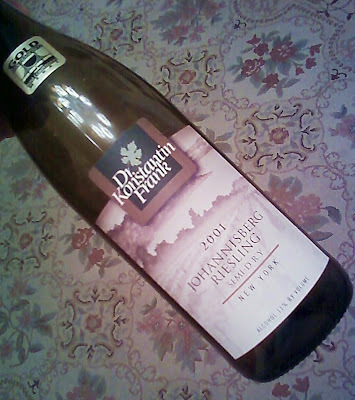 I pulled out a bottle of Dr. Konstantin Frank Johannisberg Riesling Semi-Dry 2001. It was another dusty colored bottle. Bob loves semi-sweet Rieslings. The Franks have been turning our classic German-styled bright Rieslings for five decades. Dr. Konstantin Frank was making them as far back as 1960, as pictured above. They are one of the grand cru houses of the east coast. 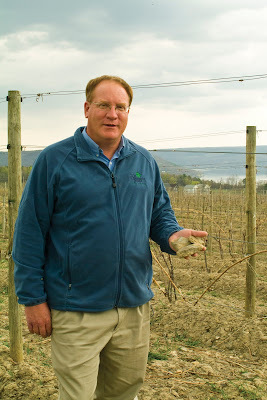 Fred Frank is the third in a long line of Franks who have helped define and give rise to classic wines in the Finger Lakes and New York state. There, in the golden glow of the dining room, me and the boys and Bob ate shrimp with vegetables and brown rice, Shezchuan Cold Sesame Noodles, General Tsao's Chicken, and House Lo Mein. I have always liked pressing my wines in the cellar, seeing how long I could store them before tasting them. Maybe this should have been drunk a few years earlier, but I have always found that semi-sweet and sweet white wines age well. It was a Konstantin Frank bottle, and semi-sweet, so I was confident that this one would work. The wine was cold and bright. A slight goldish color to it. It had hints of apple, honey, and apricot. On the tongue it was apricots and honey and a touch of green apple. Smooth and delicious. Well balanced. Exceptional. Another great vintage from Dr. Konstatin Frank! So, I came home tonight, after walking through a snow storm, only to find my next bottle for tasting already opened. Dominique and a friend of hers had decided to start it off. I was a little disappointed and a little intrigued. I was a little dejected, because opening any bottle of wine should be a small thrill, and I had missed out on it. And a little intrigued because half the bottle was gone. 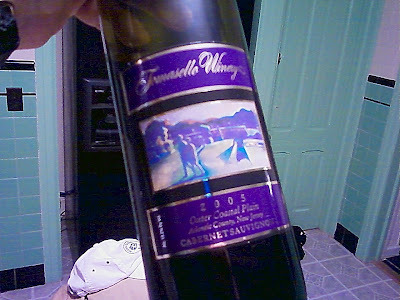 The wine in question was a Tomasello Cabernet Sauvignon 2005 Outer Coastal Plains. Tomasello is an old winegrowing family, currently run by Jack and Charlie Tomasello. In the 1930's, Frank Tomasello was a berry farmer in Hammonton, New Jersey growing raspberries, strawberries, peaches and sweet potatoes. He also had a knack for growing grapes and a passion for wine. In the 1940s, Frank brought his sons Charles and Joseph into the business. They grew their father's business into a commercial winery. They also began producing sparking wines. In the 1980s, a third generation of Tomasello's joined the business when Charles' sons Charles, Jr. and Jack came on board. Together they worked to expand the winery and revamp the vineyard. In the vineyard they planted Vinifera vines, adding Chardonnay first, than Cabernet Sauvignon three years later. Tomasello is a very large wine company. Certainly among the larger wineries of the east coast. They make everything from jug wines to well made, quality varietals. However, I must admit, it was not until I read a review by New York Times journalist Howard G. Goldberg, that I gave their better wines, more serious attention. The 2005 Cabernet Sauvignon was harvested from their vineyard and was fermented to dryness with a yeast originally isolated from a Languedoc terroir. The final assemblage was approximately 75% Cabernet Sauvignon, with a blending in small parts of Petit Verdot, Chambourcin and Cabernet Franc - all grapes grown in their own vineyards in the Outer Coastal Plan viticultural area. This wine is unfined and unfiltered for maximum flavor intensity. The Cabernet Sauvignon, "Scored an 87 at the World Wine Championships....." Best NJ Red Wine - Smoky cedar, dark chocolate sauce, pickled peppers and raisin-currant puree aromas follow through on a brisk round entry to a dryish medium body with singed nutshell and berry notes. Finished with a tart smoky, pithy fade"... Beverage Testing Institute. I opened the bottle and poured myself a glass. It was a dark red-purple color. At it smelled of dark cherries and vanilla. It was a deep, dry red. Plums and some prune come through. Nice tannins and acidity. Good balance. It was a wonderful, incredible wine. Really one of the better red wines of the east coast. A great accomplishment. My hats off to Tomasello! So we went to visit some friends last night in New Jersey for dinner. We drove in a blinding snow storm. Lot's of fun. Lots of back country roads passing small farms in central New Jersey, cows and horses hunkering down in the blustery weather. 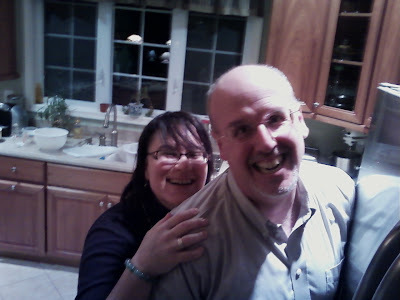 We have known Matt and Natalka for many years, going back to our days in Freehold. It is not the first time that either of them has appeared on one of my blogs. 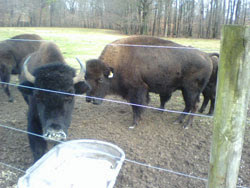 They helped us with our farm upstate. They have been with us through thick and thin. However, they have known each other for many years. Almost twenty. 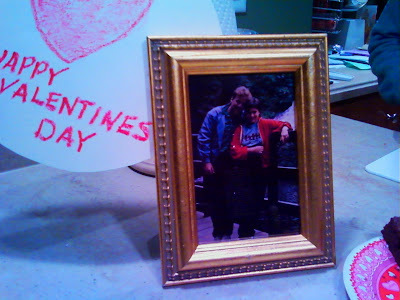 And for Valentine's Day one of hem gave the other a photo of themselves back from the Reagan years, when they were both much younger. It was fun to see. I wanted to bring something special for the evening. 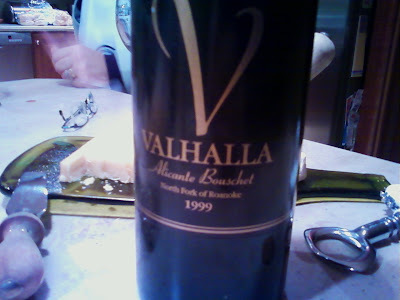 And so I brought a bottle of Valhalla Vineyards Alicante Bouschet 1999. Valhalla Vineyards has been growing grapes and producing award winning estate wines from a 2000ft. mountaintop overlooking Roanoke Virginia since 1998. Their 21 acre vineyard produces world class cabernet sauvignon, syrah, merlot, chardonnay, cab franc and more. Its decomposing granite soils and unique climate (similar to Rhone Valley of France) afford the premiere terrior on the East Coast. Acquiring the property in 1994, James and Debra Vascik began to clear away the peach trees that originally covered the landscape to make way or the grape vines to be planted. Valhalla was the first vineyard outside of California to produce Alicante Bouschet, and among the first to grow Syrah in Virginia. In 1996, construction began on the winery and barrel cave. While excavation for the cave, a Buddha statue was unearthed in the depths. With no idea of why Buddha was left behind, and the knowledge of his good karma, he now blesses our winery and vineyard. The barrel cave at 60 feet underground has the perfect conditions of year round temperature, steady humidity, and darkness to properly age wines for hand crafted beauty. Reminiscent of French caves, their cave is lined with up to 300 barrels representing four vintage years at Valhalla. Natalka was originally going to make Chicken Popikash. But she had to change her plans midway through, and so we had Chicken Tetrazzini. I had never had this dish, though I had often heard of it. None of us seemed to know from whence the name came. 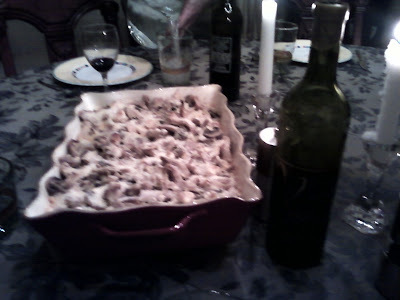 Tetrazzini is an American dish usually involving diced fowl or seafood, mushrooms, and almonds in a butter/cream and parmesan sauce flavored with wine or sherry and stock vegetables such as onions, celery, and carrots. It is often served hot over spaghetti or some similarly thin pasta, garnished with lemon or parsley, and topped with additional almonds and/or Parmesan cheese. The dish is named after the Italian opera star Luisa Tetrazzini. It is widely believed to have been invented ca. 1908-1910 by Ernest Arbogast, then chef at the Palace Hotel in San Francisco, California, where Tetrazzini was a long-time resident. However, other sources attribute the origin to the Knickerbocker Hotel in New York City. Before the meal, we nibbled on aged, imported Italian Parmasean and Old Chatham Sheep Herding Heart-shaped Camembert. And then we opened the wine. The Alicante Bouschet 1999 was something that had been sitting in my cellar for years. Valhalla is the only grower of this true red grape (the juice is actually red) outside the state of California. Alicante is opaque black in color reminiscent of ink with aromas of dark fruit, cassis, and tobacco. A rare treat! The wine was like smelling a bowl full of dark cherries. And the cherries came through on the pallet as well. Lots of big fruit up front. A deep, dark, delicious dry red wine! And for a 1999, it had cellared well, and the fruit was still front and tender. not too much acidity, but actually, very well balanced. This was an exceptional quality wine! It was a great wine to share with great friends. Thanks Matt and Natalka. And thanks Valhalla Vineyards. Tony Valenzano, Sr. was a wine making hobbyist, planting vines and growing grapes since the early 1990s on his seven acre farm at 340 Forked Neck Road in Shamong -- right in the heart of the New Jersey Pine Barrens. His hobby has grown into one of the Garden State’s most prominent wineries. 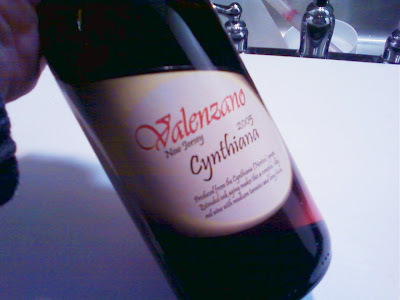 Valenzano's award winning Cynthiana is a wonderful wine. Cynthiana is also known as the Norton grape, which had originally found new life at Horton Vineyards down in Virginia. But it's a grape that has wonderful attributes and great wine making qualities. The wine has solid tannins, which in part are provided by extended oak barrel aging. Valenzano Winery’s Cythiana is the only wine in New Jersey history to wine the coveted ‘Governor’s Cup’ two years in a row for the same varietal. This is one of Valenzano's signature reds. It was a snow day, and as the winter light began to fade and as the snow raged on, the smell of roasting chicken wafting through the house. It was making me very, very hungry. And thirsty. So I opened up a bottle of Cynthiana. Lot's of big fruit up front. Plums and prunes. Deep, dark, inky. Nice dry finish. This is a nice, serious red wine. A great surprise. And a great wine! 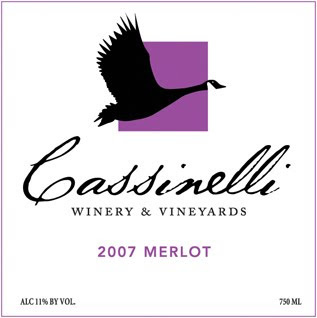 While still a fairly young business, Cassinelli Winery and Vineyards has already created a profound and distinguished name for itself. Founded in 1998, the business really started to take off in 2002. Now, just eight short years later, it produces an impressive assortment of wine varieties, including Chardonnay, Merlot, Viognier, Sangiovese, and Malbec. For Al Cassinelli, owner and founder of the winery, an interest in harvesting and winemaking sprouts from his strong Italian background and heritage. Although Cassinelli and his wife Jennifer founded the winery, his grandfather—who immigrated to the United States from Italy in 1946—sparked his interest in the wine business. With a total of 13 acres planted and 720 plants per acre, it is clear that Cassinelli will continue to expand the breadth of wine varieties and flavors available. Currently, only the mature Chardonnay and Merlot plants have been producing, but Cassinelli plans for other varieties to come on line by next year. Among the wines available at Cassinelli Winery, Cassinelli highlights the Chardonnay as his wine of choice. While Maryland is among one of the newer states to enter the winemaking industry, Cassinelli comments that many winemakers in the area do their part to contribute to the growing industry, showing enthusiasm and interest in the success of Maryland wine. “As a young startup industry trying to find its feet and direction, we have a lot of producers who are genuinely concerned about putting Maryland on the map with quality wines,” he comments. Seeing as how the industry continues to thrive, the time and effort Cassinelli contributes to his winery and products is well worth the endeavor. For him, the rich and luxurious nature of the business proves to be a rewarding process. Thanks to Al Cassinelli and his love for the winemaking industry, Maryland will continue to produce exemplary and quality wines in its own backyard. Editor's Note: The following piece is not mine. I had intended to put it in a tickler file and then drege it up when the next time the Maryland Wine Festval rolled around, but decided that with the passing of Bob Ziem, no time was more appropriate than now. The very first Maryland Wine Festival was held at the Shriver Homestead in Union Mills, in September, 1984. It was the brainchild of John Barker, then director of tourism in Carroll County. How he conceived the idea is unknown, and the first we heard about it was in the early spring, when he called the local chapter of the American Wine Society and asked for help in planning the thing. Well, sure! Anything to do with wine, count us in. The details are vague now, 20-some years later. The basic Festival was pretty much the same then as it is now, but on a much smaller scale, and was held for only one day. The Wine Education Seminars, managed by a few stalwart compadres, were part of the original program. There was an amateur wine adjudication, but it was an impromptu affair. Folks brought in their homemade wines and asked for comments on them. No one had planned for this. The idea for a wine-making demonstration had not yet germinated. The Festival got off to a rather rocky start at 10 a.m., just as the gates were opening. Some guy was driving by and rubbernecking at all the goings-on, and rear-ended a car waiting to make the left turn into the Homestead. He was immediately descended upon by 20 State Troopers with breathalizers. Turned out, even at 10 in the morning, the driver posted about a .08. And he’d not even been through the gates. One of the notable features of this event was the attendance of Leon Adams, a prominent author of many wine books. He autographed copies of the new edition of his best-selling book, “The Wines of America.” In our copy he wrote, “Let’s do this again!” And we have, of course, for 20 years now. The attendance was about 5,000 people, about twice as many as anybody anticipated. This was one of the motivations to move the Festival elsewhere the following year. The facilities at the Homestead were severely strained. A new home was found at the Carroll County Farm Museum – where the festival still proudly resides today. In those days most red Maryland wines left a lot to be desired. There were a few good ones, but the budget for the Wine-Ed Seminars wouldn’t accommodate those – the good ones tended to be the most expensive ones. So a California Zinfandel was used instead, even though a Maryland wine would have been preferable. The first white used was a Montbray Seyval Blanc. Ham Mowbray, proprietor of Montbray, complained later that day that we were doing too much educating. An attendee at one of the sessions tasted something from Ham’s tent, and proclaimed it “cloudy” (which was, incidentally, true), and bragged that he had learned about this characteristic at the Wine-Ed seminar. There were eight winery participants in that first Festival. Many of the current wineries were only a dream in their owners’ minds back then. Several of those participants are no longer with us, including Montbray. The wineries included Ziem, Byrd (both now gone), Catoctin, Berrywine, Elk Run, Woodhall and Boordy. Carol Wilson (Elk Run) said that they had one small tent, one table and two pourers, and ran out of wine fairly quickly. Bob Ziem remembers being inundated with customers, and totally overwhelmed by the number of people at the festival. Rob Deford (Boordy) agreed, said that they were surprised by the huge turnout. 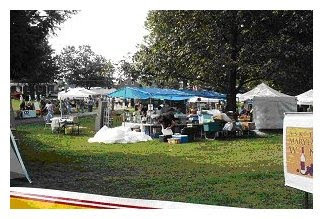 1984 was not only the first Maryland Wine Festival, but also the year that the Association of Maryland Wineries was organized. 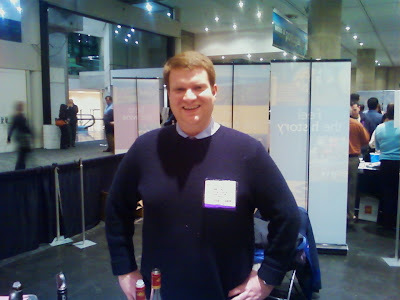 Rob Deford, the first president of the group, said that it happened largely because the wineries needed to band together in order to make sure this event was a success. They did, and it was. And still is. 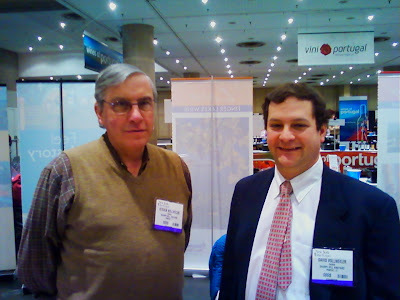 I did not know Bob Ziem prsonally, but that was not to say he was not important to me or to eastern viticultural. Who am I but some simple minded blogger? Bob Ziem did things. He went against the grain his whole wine life, and all of us, NY, NJ, MD, VA, etc., were all the richer for it. He was a champion of hybrids and other cutting edge viticultural practices. He helped solidify a fledgling wine industry in the east. He was an important man. His winery is no longer there. But his accomplishments cannot be denied. To quote the Herald-Mail (MD): He received a bachelor's degree from St. Louis University, his master's degree at Kansas State and did his doctorate work at Tulane University. He worked for NASA as director of solid propulsion for the Apollo Moon missions, worked at the Pentagon and was in charge of all surface vehicles for the DDRE. He retired from the Department of the Navy and moved in 1971 to Downsville, where he owned and operated Ziem Vineyards & Winery with his wife, Ruth. That is a man. That is a life time. The Maryland wine industry recently lost one of its founding members, Bob Ziem of Ziem Vineyards and Winery. Bob Ziem and his wife, Ruth, were pioneers in the industry—opening his winery when only five existed. Ziem grew all of the grapes —all native and hybrid varieties—for the winery, and championed lesser-known varieties like Landot Noir. “He was adamant about red wine, stating that “all wine would be red if it could,’” says Carol Wilson of Elk Run Vineyards. Ruth was always by his side in the wine and grape venture, and still attends many Maryland wine events as an industry enthusiast. Ziem was a U.S. Army Veteran and had a long government career. He was director of solid propulsion at NASA where he worked on the Apollo Moon missions, worked at the Pentagon and for the Department of the Navy prior to starting the winery in 1971. Ziem was 85; he died at home in Fairplay, Maryland on January 25, and is survived by his wife, Ruth, daughter Karen, sons Kurt and Eric, and brother, James. Vynecrest 2000 Vingoles - Simply Awesome! So we made some chicken brests marinated in some locally made bbq sauce, and I made a big batch of stewed fresh multi-colored peppers and five pounds of roasted potatoes getting ready for the Super Bowl. We had some chips and dips with the pregame and the first quarter, and then by the second quarter we were ready. 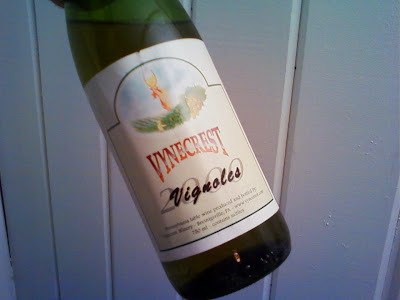 Originally I picked a red, and as I was searching around found a bottle of 2000 Vignoles from Vyncrest. Now I was not sure what to expect. A vignoles from 2000 was either going to be beautiful or it was oing to simply be no good. I figured it was a 50/50 shot. Not that Vynecrest is a bad producer, but that is the nature with such white wines. A mediocre one would die an ugly death in the bottle, and a well made, well-balanced one would excel.. Knowing Vynecrest, I'd taken my chance and cellared it. I reviewed my notes from ten years ago. Late harvest style. Sweet. Light, honey, apricot, and flowers in the nose. Wasn't sure what to expect, when we uncorked the dusty old bottle with their old label on it. I really should have had blue cheese and raisin walnit bread, but this woul have to do. The wine was golden in the glass, slightly darker than I remembered it. It had lots of body. Honey colored. The aromas were still there, and very strong. And as for the taste. Incredible! The honey and the apricot were very pronounced. Great acidity! Super balance. A tremendous wine! I had it with my chicken, it went beautifully. Congrats to JOhn and Jan Landis! West Virginia farmers who grow specialty crops are getting financial help from the state. The state Department of Agriculture is giving nearly $185,00 in grants to help farmers promote their specialty crops. Agriculture Commissioner Gus Douglass announced the grants on Thursday. The projects receiving funding include West Virginia State University research into building economical and eco-friendly structures that farmers can use to extend the growing season for fresh produce.West Virginia University will evaluate 14 varieties of wine grapes to determine their suitability for use by West Virginia wineries. Specialty crops include fruits, vegetables, herbs, horticulture and nursery stock.Funding for the grants comes from the U.S. Department of Agriculture. The viticultural appellation, called the Southeastern New England Wine Growing Appellation, stretches from Cape Cod and the Islands through the South Coast of Massachusetts and Coastal Rhode Island and Coastal Connecticut. The common thread through this wine region is their close proximity to the Atlantic Ocean and their Southeast facing coastline which captures the warm Gulf Stream waters in the summer and fall. It is a cool grape growing region with most wineries there concentrating on white wines and sparkling wines. The Coastal Wine Trail winds through the heart of the Southeastern New England Wine Growing Appellation. These 9 wineries can be visited in 2 to 3 days. This is one of the most exciting trails in all the north east and one that has the firepowr to become one of the most impressive! The wineries are wonderful! A great trail. A great idea.